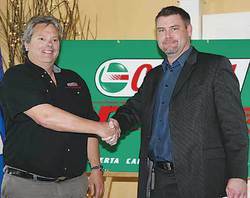 One of the owners of Castrol Raceway, Rob Reeves (on left) congratulates Scott Walker on winning the VIP package to the Rocky Mountain Nationals at the April Leduc Regional Chamber Luncheon. April's Chamber Luncheon took place at the lovely RedTail Landing Golf Club, giving attendees an opportunity to see the natural surroundings at a time of year not normally enjoyed on a golf course. The kitchen staff must have enjoyed having people to serve again as well since the buffet this day was simply stellar. And keeping up the fast pace of the last year the Leduc Regional Chamber of Commerce were thrilled to welcome another 15 businesses into membership for the month of March. Today's presentation was a little bit unique in that there were two speakers sharing their views on the topic of servant leadership. Donna Tona of Tona O'Reilly Associates Inc. and former Chamber President, along with Don Shay the president of Accrescent Consulting Inc. at Crestcom International did a great job with the shared speaking responsibilities. They both told uplifting stories of their personal experiences when they encountered examples of servant leadership in business, and then challenged the audience to understand the difference when placed against anecdotes that exemplified the exact opposite. Donna opened the afternoon by stating that if everyone had come there expecting to hear a customer service seminar, they were about to be surprised. Don then introduced a video that was played on an overhead screen by asking everyone to keep track of how many times a ball was passed between three white shirted people in the video. It was fairly challenging as there were six people in total constantly moving and throwing balls back and forth, three in white shirts and three in black. At the end Don asked two questions; how many balls had been thrown by the white shirts, and how many people noticed something strange about the video? Several different numbers were shouted out in response to the ball question, but less than a quarter of the people in the room raised their hands that they had noticed something odd in the video. Don then replayed the video and told everyone to simply watch it and not try to count balls. Everyone who had not raised their hand were shocked to see a man in an ape suit wander straight through the ball tossers and even stop in the center to scratch his head before exiting the scene. None of them had noticed this happen the first time! Don explained that as business owners, the same thing can happen; you get tunnel vision, particularly with employees. Servant leadership is learning to deal with both customers and employees in a different way. Servant leadership empowers managers and employees to deal with problems immediately and directly. Don questioned as to how most people would prefer to be dealt with when a problem is encountered. Is it preferable to go through a long chain of command, be shuffled through multiple contacts, none of which seem to be able to help you, only to finally give up in the end or feel that a quality resolution was never truly achieved? Or is it preferable to have your issue dealt with immediately and appropriately by the employee you are dealing with at the time and finish feeling like a valued customer? He specifically asked the business owners in attendance "How much money do you spend attracting new customers? Probably a lot right? So how much money do you spend keeping the ones you already have?" Donna quoted Robert K. Greenleaf by saying "A great leader is seen as a servant first!" She then made everyone chuckle by stating "Servant leaders don't eat their team! They listen and have empathy. Not everyone speaks the way we want to listen. Sometimes you have to take the time to understand what your employee is really saying, then respond from the heart and respect a person's spirit and originality." She queried the audience with a show of hands as to how many of them were truly aware of their ethics and values? A fair number of hands shot up throughout the room. Donna then asked how many had been tested and stood firm? Fewer hands were raised this time. She continued on to say that servant leaders do not seek solace from outside sources during difficult times. They ground themselves and use their inner strength and resolve to do what is right. Servant leaders practice stewardship and think outside the box. Rather than automatically promoting a stellar employee, a servant leader might inquire as to the employees idea of what a reward might be. Perhaps the employee is very happy in their position and does not want the promotion, in which case a servant leader would look for a different system by which to reward this employee rather than "punishing" them with the cookie cutter reward they do not want. Stewardship can be defined as "holding something in trust for others". Donna and Don encouraged managers to view their jobs in this way and to hold their positions in trust for the person who will be following them. Don and Donna closed the afternoon by saying that "People have value over and above their 'measurable' growth potential to an organization. Servant leaders build their community in work spaces, they have fun and they work hard. If you got into management because you were promoted into it, then take this as an opportunity to become a servant leader."